I have a fun and easy diy to share with you today! If you have extra jars, mason jars or otherwise, lying around, Mod Podge, and food coloring, you can easily turn your plain jars, into beautiful color stained jars for centerpieces or home accents! I chose an old cardboard box to be the surface for this project, as I had no newspaper to lay down, or anything else to prevent leakage to seep onto my dining room table. This worked like a charm, but whatever you have is fine. 2. I filled some glass bowls I had available with 2 Tablespoons of Mod Podge, 1 teaspoon of food coloring, 1 teaspoon of water-this helps with transparency. I chose glass bowls because that is what I had, but you could use disposable bowls you might have, etc. I took my paint brush and mixed the MP, food coloring and water together until everything was well blended. You could eliminate the bowls and pour everything directly into the mason jars. I didn't do this I wanted to make sure everything was well blended. *Note: To make the stained colors less intense, I tried with 1/2 tsp. of food coloring, which gave it a hint of color. 3. I then poured the MP mixture into the mason jar, using the paint brush to help get all of the mixture into the jar. Then I slowly tilted the jar to let the pooled mixture begin to coat the sides of the jar, turning gently and tilting more as the coating made its way to the jar opening. 4. Once jar is completely coated on the interior, I let the jar sit upside down so any access mixture could drain. If you have gaps at the jar's opening, like I did, I took my paintbrush and kind of dabbed the brush around to easily cover up those gaps. 5. Once jars were coated with MP mixture in different colors, I let the jar sit outside to dry and for the coated material to turn into a transparent color. 6. After I felt the mixture was done pouring down the sides, I turned the jars right side up, and dried them in the sun. I took my paper towel, dampened it, and wiped any excess mixture that might have covered the lip of the jar. Everything came off easily. And after less than an hour of the jars sitting in the sun, the mason jars went from murky colored glass to pristine clear stained glass! 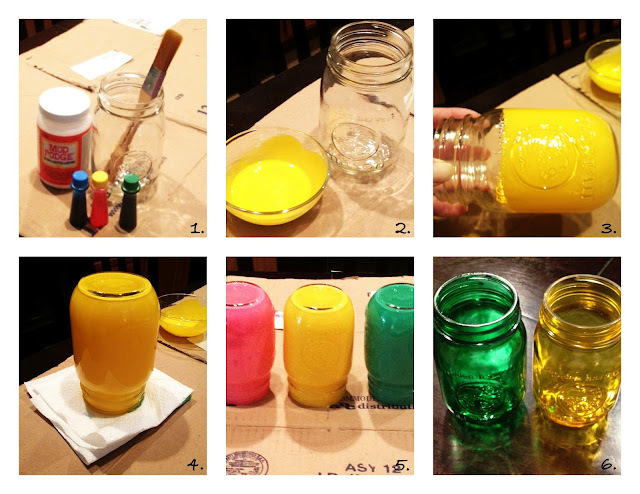 One tip...I wanted to do pink, yellow and green stained jars for my upcoming baby shower. I had the regular grocery store food coloring in green and yellow, but I had pink in the kind of food coloring you use to color melted candy. I thought I'd use that, and this did not work! Thus I have the examples of the green and yellow jars, but not the pink jar, it looked horrible! Use the regular old food coloring bottles that have been around for ages, and not the new kind that is for candy making!! 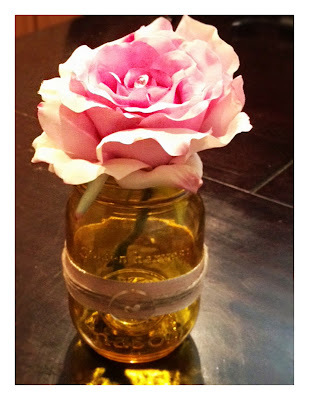 This project is perfect for your wedding and bridal shower centerpieces, and beyond. 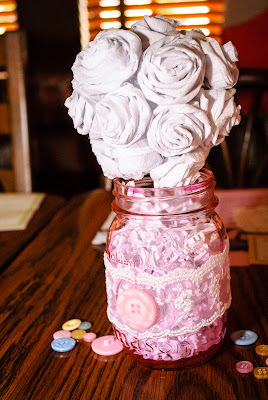 I made the jars for my recent baby shower, and used crepe paper rosette poms to place on top of the jars as the centerpieces. The theme of the shower was "Cute as a Button", so I embellished the jar with some lace and a button to play out the theme. They turned out so cute! Use your imagination to create the centerpieces to match your theme, and have fun! Love this!!! I know what I'm doing this week!! Thanks!! Will this only work with gloss mod podge, or will matte work also? ?